Just finished watching Read Or Die, and I thought it deserved a post. I was itching for some new anime last week and remembered that still hadn't watched R.O.D., as it patiently waited in my collection for over a year. I wasn't sure if it was going to scratch this particular itch, but I gave it a shot anyway. I started with the OVA episodes, which did a good job of setting up the background story. Then I quickly moved on to the series. I must admit that the first third or so was fairly slow. It took a while for the characters to start becoming interesting and the story to generate a little more intrigue. Eventually the pace quickened a bit, and I was looking forward to each successive episode. My overall impressions after having finished are somewhat mixed. I enjoyed it as a whole, but there are shortcomings I wish to note. In general it's a fairly formulaic anime, with a standard scenario. A special group of people fight against a misguided organization that vies for control of the world in order to change it. That aspect is what weakens Read Or Die for me, as it offers little in the way of surprise. What remains one of the show's strengths, however, are it's characters and their side stories. I think some of the most moving moments occurred during the interactions between the characters when they did not particularly relate to the grand scheme of things. In particular, the episode which fleshed out how the three sisters met was probably the best. Though I must also say that Anita's moments at school, and her relationship with Hisami are among the most complex. Ultimately it's all the relationships between the characters which kept me watching, while the main plot felt less important and even trite at times. If you're looking for a decent show, with some of the best female characters out there, then give Read Or Die a chance. At least get half-way through the series before you make up your mind. 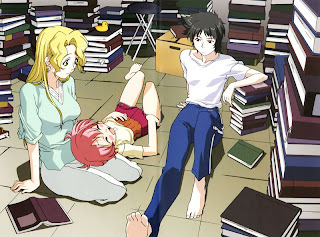 If a more well rounded anime is your cup of tea with high polish in all aspects, a la RahXephon for instance, then you may want to pass on this one.